Can the migration across the Mediterranean really be considered a security threat? The European Council, the Council of Ministers and implicitly also the Parliament are dealing with the flight over the Mediterranean from a narrowly protectionist perspective. The actions that were decided by the European Council on 23 April 2015 essentially reproduce the policies that have proved to create, rather than reduce, risky migration strategies for those in need of protection and others. At the top of the agenda is fighting human “trafficking” (it is noteworthy that the Council uses an erroneous legal term for a phenomenon that constitutes human smuggling). The second issue on the agenda is the decision to increase presence on the Mediterranean with additional vessels, planes and personnel. To cooperate with countries of origin and transit is the third issue on the agenda, while a commitment to increase internal solidarity and responsibility is last on the action program. All four issues – the criminalization of migration, tougher border control, pressure on non-EU states and finally an increase in solidarity – have always been seen as the solution to real and imagined migration crises in Europe since the fall of the Wall. At the same time the UN High Commissioner for Refugees has found that the number of refugees in the world has not been this high since the Second World War. This reiteration has something forced about it; there is reason to seek the structural causes behind it in EU history and politics. At the same time we notice an escalation; the EU is planning to use force against smugglers and their property outside EU territory, in analogy with the operation Atalanta that targets pirates outside the Somali coast. When operation Atalanta is mentioned as a prime example in handling unarmed migrants and smugglers, a qualitative transition can be noted, where unarmed migrants are compared to armed pirates. Smuggling of migrants, some of whom are refugees, becomes an inverse form of piracy. To return to my initial question of whether migration across the Mediterranean can constitute a security threat, I think the lack of solidarity in EU asylum and immigration policy is a real threat to European unity. In the following I will briefly describe the historical structures that burden this policy area and the dilemma that the EU and its Member States are facing today. Thereafter I will focus on the question of what the obstacles are that lie in the way of a more equal distribution of asylum seekers and refugees, one that favours both Member States and asylum seekers, and how these aforementioned obstacles can be overcome with a package consisting of four measures. The historical background to EU’s refugee and migration policy is that non-EU citizens’ rights have been sacrificed like pawns to create acceptance for free movement of EU-citizens, as Meriam Chatty has shown in her recent dissertation. Since the days of the Rome treaty, Member States have been given strong legal incitements to divide and conquer among foreigners. Foreigners who were citizens of another Member State were privileged, while foreigners from outside of the EU were left victim to the arbitrary decisions of the state sovereign. Member states have ever since readily guarded their sovereignty towards non EU- citizens, and defended it quite successfully also within the EU institutions. The significance of this almost constitutional trait cannot be overestimated in today’s asylum and migration crisis in the EU. This policy area can in large be seen as a collectivization of the protectionist side of the nation state. If we think that European integration is anything else than a reproduction of the nation state structure on a higher level of complexity, that is a major problem. The fact that nationalist protectionism has left its mark on EU asylum and immigration policy is of course to the disadvantage of non-EU citizens. But it also affects the cohesion among Member States. This is clearly demonstrated by the Member States’ incapacity to create an asylum and immigration policy that is marked by solidarity, despite article 80 TFEU prescribing just that (see next section). The Dublin Regulation, which regulates which EU state is to examine the substance of an asylum application, together with the Schengen Code, which regulates border control, form the base of common EU asylum and immigration policy. The Dublin Regulation creates a system where the responsibility for examining an asylum application is placed on those Member States that have the borders which are the hardest to guard. Consequently, the alleged behaviour of these Member States, among them Italy, of not registering newly arrived asylum seekers and putting them off with substandard reception conditions contrary to EU law, is not surprising. It is the law itself that creates an imbalance in the reception responsibility, which in turn leads to sidestepping of the law. This destructive structure has been well known since the 90s, but the Member States rejected fundamental amendments when the possibility to reform the Dublin Regulation was given in 2000 and 2012. Earlier I described that the actual policy is headed in the opposite direction – namely towards a de-solidarization in refugee reception. The question is nonetheless justified: can the solidarity rule be a meaningful counterweight? The prevailing interpretation is that article 80 TFEU concerns solidarity in between Member States only, and not solidarity between Member States and refugees, or Member States and other recipient states in crisis regions (think Lebanon and Jordan, who are carrying a disproportionate burden in the reception of Syrian refugees). But the term ”solidarity” is pointing in the opposite direction. The term has its roots in Roman civil law, referring to the relationship between a creditor and a group of people responsible for the debt. In joint and several liabilities, the creditor can demand payment of the whole debt from any one of the debtors at any time, not just that particular debtor’s share of the debt. Solidarity thus increases the chance of a debt being paid. How the debtors among themselves handle the situation when the creditor has demanded payment from one of them, is another question. How do we apply this reasoning in EU’s asylum and immigration policy? The use of the term ”solidarity” is only meaningful if you consider the Member States to be equally responsible to fulfil a legal claim brought by an asylum seeker. This claim is founded in human rights law and in refugee law, where it is stated that states cannot return persons in need of protection to states where they face risks or threats. The interesting aspect of the term ‘solidarity’ is that it provides both the creditor, and in turn the asylum seeker, with a freedom of choice. The claim can be directed at any Member State. This contradicts the coercive measures of the Dublin Regulation, where other factors than the preferences of the individual are guiding. In order for there to be solidarity among Member States, naturally there has to be some sort of compensation for the state that is subject to the asylum seeker’s claim of solidarity. My point is not that article 80 TFEU should be reinterpreted in this way. My point is that article 80 TFEU is so contradictory in its legal construction that it cannot lead to any practical results – neither in policy nor in front of the EU Court of Justice. What would happen if the EU’s weak solidarity term was applied to the market? Let us have a look at an example: on one hand we have ten businessmen who take up a joint loan, and on the other hand we have a bank. Let us assume that the bank will only lend money to the group if they accept that the bank can demand payment of the whole debt from any one of the debtors – that is: joint and several liability. An agreement is signed and the money collected, but the businessmen forget to agree between them what to do if the bank shows up one day and terminates the loan, demanding payment from only one of the businessmen. What happens if the remaining businessmen do not have the money or have other reasons not to pay? But this is not something serious businessmen would do, right? No, they would not. It would be silly to skip such an important step as the signing of an agreement between them, since it creates an unnecessarily messy situation that might jeopardize the cohesion and finances of the common business. Unfortunately this is what the European Union has made its system. What happens when a group of asylum seekers, just like the bank, demand fulfilment of the agreement from just one Member State? This is exactly what has happened. A majority of the asylum seekers that have arrived in 2015 seek asylum in Germany and Sweden. The Union does, as we know, have another 26 Member States. States such as Italy and Greece are highly affected by being first countries of asylum; many asylum seekers and other migrants enter the EU through these states, often after having risked their lives on the Mediterranean. However, asylum seekers do not remain there, largely because of the poor reception conditions. Both first countries of asylum, like Italy and Greece, and final countries of asylum, such as Sweden and Germany, find themselves immensely burdened by the growing number of refugees that have entered the EU during 2015. It has led to strong tensions among the governments and unusually unruly meetings in the Council of Ministers. The idea of a united Europe seems to be at risk. In 2015 the European Commission proposed a mandatory system for a more even distribution of asylum seekers among Member States. Not surprisingly this proposition has been met with forceful opposition from the UK and a number of Central European Member States so far. A mandatory distribution would make these states receive more asylum seekers. We must have fire protection ready before the fire, not when it is already burning, and we need to organize the solidarity mechanism before solidarity is claimed. How can long-term solidarity be organized? In my earlier research I have proposed a discussion of three dimensions that can contribute to solidarity: sharing norms, distributing funds and distributing people, here asylum seekers and refugees. Sharing norms within the EU means that all Member States give asylum seekers and refugees the same rights and benefits, that the asylum procedure follows the rule of law and that security in reception is equivalent to that of other states. If everyone applies the same norms there is less reason for asylum seekers to choose certain Member States as their goal, while not choosing others. It is not merely a question of legislation, but also legal practice. It is not acceptable that some Member States reject asylum seekers with certain nationalities on a regular basis, while in another EU country they are deemed to be in need of protection. Nor is it acceptable that one EU Member State invests significant resources in building well functioning reception centres with dedicated staff, while asylum seekers in another Member State are forced to live on the streets. These cases will however still appear, despite common norms. 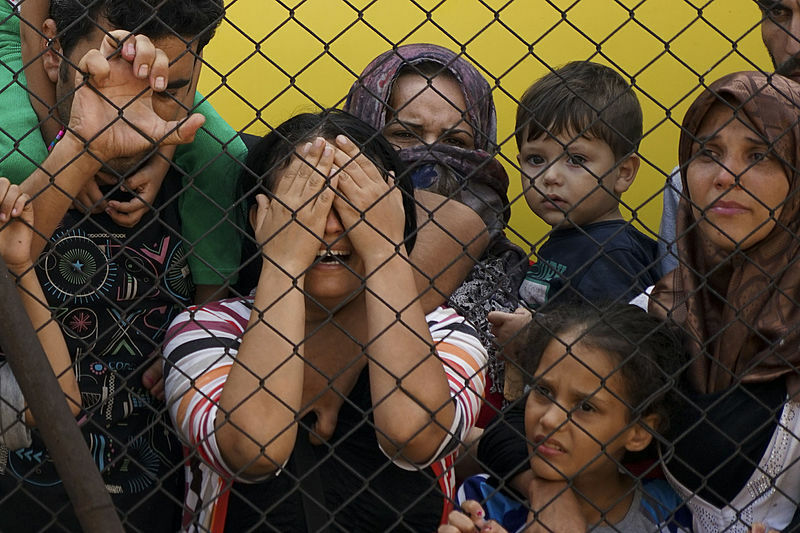 Reception and asylum procedures are regulated in international law, mainly through the basic rules in the Refugee Convention and the European Convention on Human Rights. Within EU law many directives and regulations concern migration and flight. One problem is that the EU regulation’s ambition is set too low to really make a difference in evening out the uneven reception of migrants in the EU. Another problem is that the monitoring of compliance of rules is insufficient, and it might take years before the European Commission, the EU Court of Justice or the European Court of Human Rights deals with norm violations in a state, if they deal with them at all. The next dimension of solidarity is distributing funds among EU Member States. We can imagine two reasons for this. One is to help Member States with weak reception systems or big inflows of refugees and asylum seekers to improve the reception and protect those who need protection. The other reason is that states that receive fewer refugees compensate those states that receive more refugees. This form of distribution policy will raise the issue of whether money and refugees are economically comparable; can you really purchase hospitality in a state with pounds and cents and consequently buy off your own responsibilities? The reception of asylum seekers and the integration of refugees cannot be reduced to a financial issue. Refugee reception in all states is a question of identity policy. Redistribution of funds thus cannot solve the problem of unequal distribution in certain Member States, it can merely constitute a minor contribution to a more comprehensive solution. Today there is an economic redistribution in the asylum policy area, orchestrated by the EU. Between 2014-2020, funds have been allocated in EU’s budget that Member States can draw money from. For example Sweden could be awarded up to 118, 5 million Euros, Spain 257 million Euros, Greece 259 million Euros and Italy 310 million Euros. The sums are hardly trivial, but they are still not likely to affect the political attitude in the states’ governments or among voters. You might get the feeling that it is insufficient to share norms and distribute funds, and that the EU should also deal with distributing people. Thus we have reached the third and last dimension of solidarity. It is also the most sensitive one – we have, after all, had bad experiences in history when displacing people. Asylum seekers often have good reasons to choose a certain country of asylum, and it does not necessarily have to do with the asylum procedure. The language, access to the labour market, presence of family members, the existence of a diaspora, the state’s reputation regarding human rights – all of this can affect the decision. And many of these factors are directly related to integration possibilities, finding work, paying taxes, learning the language and becoming part of the community. If we were to create a mandatory distribution system that ignored these preferences we would probably end up with a big number of asylum seekers trying to bypass their assigned country of asylum and instead try to move to or stay in their preferred country of asylum. The use of coercive measures would increase, which means more resources to the police force bringing candidates eligible for transfer into detention or forcing them onto planes. Forced returns and detentions are very costly, both economically and also counting the risk in terms of trauma, self-destructive behaviour or violations of human rights. Are there examples of distribution of asylum seekers within the EU? The answer is the Dublin Regulation. Although its rules were not created to accomplish a more equal distribution of asylum seekers and refugees, but to give incitement to stronger border control. According to the most used rule of the Dublin Regulation, an asylum procedure is to be initiated by the state that enabled entry to the EU, whether that entry was legal or irregular. This means that states with external land and sea borders that are difficult to guard are burdened under the Dublin Regulation, while states such as Sweden and Denmark are alleviated. In theory, the last mentioned states could transfer asylum seekers to the more southern Member States, if they can show that they were registered there after entry to the EU. In practice the system is falling apart, since the reception systems in many southern European states are so bad that the European Court of Human Rights and the EU Court of Justice have decided to stop transfer of asylum seekers there in a number of high-profile cases. Some southern European states have stopped registering newly arrived asylum seekers and are pretty satisfied that these are migrating further up north. They do not view themselves as capable of dealing with two tasks at once: being both first and final country of asylum, both saving lives on the sea and taking care of the rescued. The Dublin system is a mandatory system. Today we see that it is a big failure. Another mandatory system aiming to even out the uneven distribution Dublin has created, would mean a duplication of bureaucracy, costs and human suffering. What remains is to consider a non-compulsory solidarity system. Directing asylum seekers towards countries they have not earlier considered as their final country of asylum is first and foremost about increasing the protection of rights and non-discrimination in these states. Why do asylum seekers not stay in Italy or Greece when they cross EU’s outer border? ”Clearly good quality first reception is the key to equitable distribution of asylum seekers”, Elspeth Guild, professor of immigration law, wrote on her blog in 2015, referring to the poor conditions in the Greek and Italian asylum reception systems. To distribute people is firstly about sharing norms; the rights of the asylum seekers must be guaranteed in reality, not just in law. Apart from applying a solidarity system, EU states must strive to reach potential asylum seekers in the beginning of the migration procedure. Today the diaspora, human smugglers and rumours influence the individual’s choice of means and goal. The contact with the authorities is not initialized until late in the process – generally not until the asylum seeker has reached the country where she wishes to seek asylum. This is too late to be able to correct an erroneous view that affects the choice of country of destination. A future system must provide an incentive for the seeker to reach out to the authorities as early as possible. Then authoritative information about the prosperity of an asylum application can be given, and the human smugglers’ information monopoly would be broken. What can EU Member States do concretely? Today there is a greatly developed network among embassies. Persons who are considering leaving their area of origin to seek asylum in Europe should be given reason to visit one of these and start the asylum procedure there. In the eventuality of a rejection during the embassy procedure the seeker will realize that she should not invest a fortune and risk her health to travel irregularly to the country of the embassy she has contacted. A positive decision would mean that a humanitarian visa is granted so that the seeker can fulfil the asylum application in the Member State of the embassy she has visited. In this way the seeker could travel legally to the EU and the Mediterranean and other smuggling routes would be avoided. The funds that would go to smugglers can be used in a better way. Why would such a system of humanitarian visas constitute an additional step towards an equal distribution of asylum seekers? The first reason is that a fairly big number of contact points with the asylum process would be made available all over the world. Today the smugglers’ routes and skills decide what Member States the asylum seeker will come in contact with. Well-resourced Member States usually have more embassies than less resourced states. This in turn creates a proportional distribution. With this system, it seems unlikely that for example the UK could continue profiting from its geographic location and only receive four per cent of all asylum applications in the EU, as the country did under the first quarter of 2015. My point is not to abandon the territorial asylum system of today, but to develop a system of humanitarian visas as a complement. The UN High Commissioner for Refugees, António Guterres, has urged the EU Member States to open up more legal channels that can lead to asylum. If the EU really wants to own up to its promise of solidarity, it has every reason to act on his request. The Dublin Regulation must be abandoned and asylum seekers shall in the long term be granted free movement within the EU. The Dublin system is not functioning and asylum seekers are actually already moving between Member States. The protection of rights must be upheld and increased in the reception systems in most of the EU Member States. This will probably be pretty costly and it is not likely that the southern European Member States can finance it on their own. Greece is probably the most extreme example of a state with great needs and small resources. Other states must step in and funds be redistributed, to a greater extent than today. Monitoring the compliance with rights must be intensified through domestic courts, the EU Court of Justice and international courts and supervisory agencies. Today certain states can benefit from slow procedures and by setting aside basic rights, fully aware that they will get a slap on the wrist by a court – but only after a number of years. During that time the state is able to send the message that a tough and restrictive approach is implemented. A system with humanitarian visas binding together states’ embassies with their territorial asylum systems must come into being. Individual states could go ahead and launch a new practice at their embassies under current Schengen regulation. But of course it would be better if all Member States committed and a common frame was to be provided in an EU directive. Together with two colleagues I have presented a detailed description of the pros and cons of such a system in a study that the European Commission published in 2003. Finally I would like to return to what I have identified as a constitutional issue above, namely that the nation state’s protectionist approach has contaminated the whole policy area of asylum and immigration. It is possible to try and steer policies in the opposite direction through reforms that increasingly take into account the rights of non-EU citizens, and that secure their right to entry into EU territory when they as refugees are in need of protection. Experience gained since the 1993 Maastricht Treaty shows that the reformist position is doomed to have a marginal impact. In the worst case scenario it legitimates violation of rights and the inter-state tensions coming from the unequal distribution of asylum seekers and refugees. That is why I believe that it is most urgent to discuss the term democracy and its significance for EU policy in this crucial area. After all, I am a jurist for a reason. When the law leads to people drowning, I have to be prepared to re-evaluate the law and seek a new content for it. I support democracy for a reason. When democracy is said to need a deadly policy to survive I have to be prepared to seek a new form of democracy. Gregor Noll is professor of international law, Faculty of Law, Lund University, Sweden and is currently the holder of the Ragnar and Torsten Söderberg Foundations’ Professorship in Memory of Samuel Pufendorf. This entry was posted in Uncategorized and tagged immigration, Solidarity. Bookmark the permalink. Again there are a number of questions having a hard time to emerge about this crisis. There is a big difference between those who have a right to asylum, and those who are merely “seeking” it. What about those who do not qualify for the status of asylum or as refugees? These seem to be the overwhelming majority of people currently crossing the EU borders in undocumented ways. Are they really going to be repatriated? Once the emergency situation which has caused the dislocation of actual refugees (e.g. Syria) will be normalised, are they going to return to their country of origin or not? Second point: the legal approach views such phenomena from an individual perspective. Has Mr. XYZ the right to settle in a country of his choice? The problem is that when you multiply this single case by hundred of thousands or millions of cases, the political aspect of the question appears in all its magnitude. And since Europe has absorbed tens of millions of migrants (Fortress Europe?) in the past few decades, with Germany alone having for instance 13,000,000 people with migration background, then the question of allowing further immigration becomes clearly more problematic, especially considering that, in the view of many, the integration of numerous immigrant communities has been a failure, and overall the entire mass immigration policy, a mistake. That is why numerous governments have been elected on a platform supporting higher barriers to immigration, or ideally zero net immigration. Furthermore, the capitulation of any meaningful external border management, as happens in Italy, will lead only to more and more people immigrating illegally, precisely as the Italian experience should tell us. It also seems to me that this piece ignores the enormous complicity between sectors of the Italian state, of the church, and of criminal organisations of both shores of the Mediterranean, without which an absurdity such as operation “Mare Nostrum” would have been unthinkable (see: http://www.e-ir.info/2015/06/02/the-politics-of-the-humanitarian-crisis-in-europe/). Lastly, we are here dealing with the ethnic and religious composition of Europe, which is a highly political matter. We are dealing with political demography, which is a primary security concern. By the way, it is one of the reasons whereby one may explain the Syrian or Libyan conflicts in the first place.